I just returned from my first photography trip to Iceland. It is an amazing country with diverse and spectacular scenery. While Iceland is only a couple of hundred miles across in either direction, there are not any roads to travel it that way; there is a ring road that is over 1000 miles long and many unpaved, rough roads into the interior. But what a place! I spent the first few days in the Snaefellsnes Peninsula with its amazing coastline, glacier covered mountains, harbors and waterfalls and hotel Budir and its famous black church. From there I travelled quickly through the Golden Circle; I say quickly but it actually took a day because that is when I learned that roads that may be on a map are not necessarily passable even in mid summer. From there to Hella and on to Skaftafell NP, an amazing mountain range and set of glaciers that seems to capture the light. Jokulsarlon Lagoon followed. Another amazing place with icebergs the size of houses crashing with the sound of a cannon into the lagoon, to be swept out to sea with the flowing tide. It was a deeply moving place with a profound sense that something powerful is changing. Below are a few images from this journey. Many more can be found in the Iceland gallery. 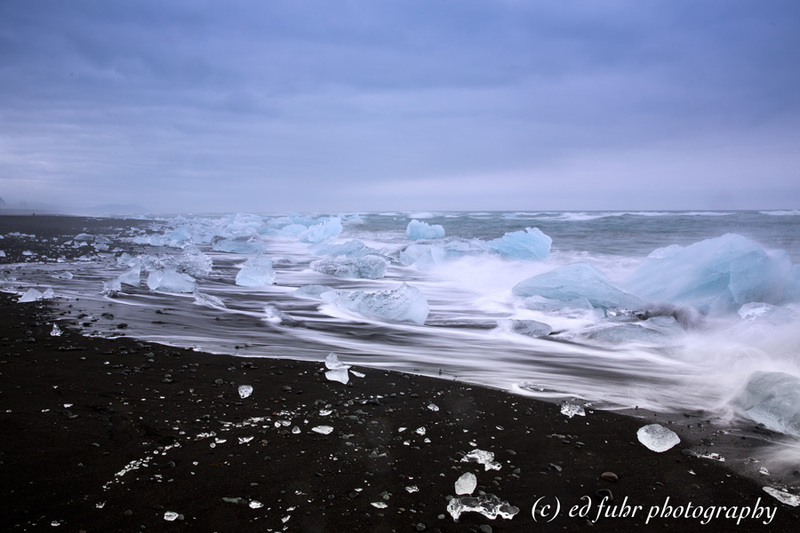 Every day the tide enters and leaves the Jokulsaron Lagoon via a quarter mile inlet, sweeping icebergs into the North Atlantic where they are battered into pieces, eroded and then deposited by the tide on the black sand beaches. When I arrived at 5:00 this morning following a powerful storm, I was stunned: thousands of icebergs had been orphaned as far as the eye could see on the beach by the prior nights ferocious tide. 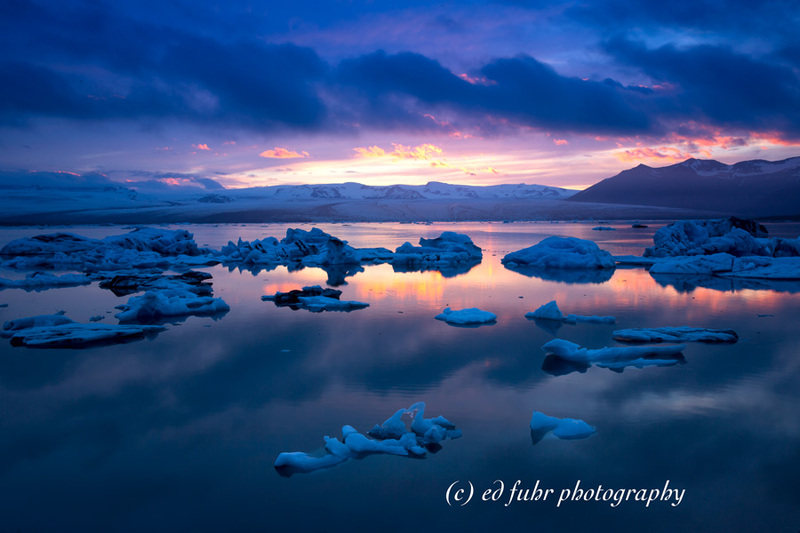 Icebergs that have broken off of Iceland’s largest glacier float serenely at sunset in Jokulsarlon lagoon. But with the departing tides, these icebergs – ranging in size from large boulders to the size of a house – float out to the sea to be pummeled by the waves and destroyed by the salt. It is a deeply moving sight bearing witness to this inexorable process, and there is a strong sense that something is changing and passing away. and tagged iceland on July 26, 2015 by Ed Fuhr.